This silver tone metal Celtic bracelet features 3 metal beads and 2 resin beads with knot-work designs that include the Trinity. The 7 1/2" long snake chain has a Celtic knot closure catch and is made by Solvar Jewelry in Dublin, Ireland. 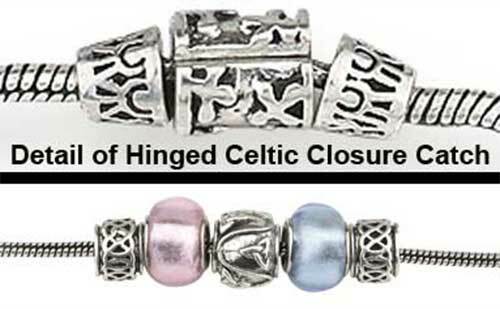 The bead bracelet is gift boxed with a Celtic knot history card that is complements of The Irish Gift House.